Dangerous elevators and escalators are serious issues in cities and towns across the United States. In our state, many of these devices are used every day by commuters who use the MBTA to get around town. When these devices are not working properly and safely, elevator and escalator accidents in Boston can result. Companies have a responsibility to ensure that these devices are working safely and properly. When they aren’t, injuries or deaths can result. Boston isn’t the only big city with this problem. Our Massachusetts elevator and escalator accident attorneys would like to tell you about the recent problem in New York City as well. According to FOX 5, there have been continuous investigations into the city’s out-of-service devices. These escalators and elevators located throughout Manhattan subway stations have been working improperly for years. The target of a recent investigation was the Lexington Avenue and 53rd Street station. Officials report that at any one time, at least one out of every 11 transit authority escalators are shut down. When these devices are put out-of-service, people are forced to use the stairs, which could pose slip-and-fall risks, especially during inclement weather. This mainly applies to children and elderly riders. When escalators and elevators aren’t working properly, they also cause congestion among riders on the subway platforms too. When these areas are overcrowded, the risks of people being shoved onto the tracks can increase. In New York, FOX 5 reported that many of the out-of-service escalators were owned by private companies even though they’re used in the city’s subway stations. These companies no longer take care of these devices because the city cut the deal they made with them. The deals were cut to save more money for the construction of larger buildings. To help raise awareness about the importance of keeping elevators and escalators in good-working condition, the Elevator Escalator Safety Foundation hosts National Elevator Escalator Safety Awareness Week during the second week of November every year. Through this week-long campaign, the foundation hopes to recruit the support of residents throughout the country to help raise awareness about the importance of properly working elevators and escalators. 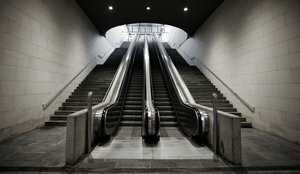 Every year, there are nearly 50 people killed and another 17,000 people injured because of accidents on escalators and elevators in the U.S., according to the U.S. Bureau of Labor Statistics and the Consumer Product Safety Commission. -Be sure you know which way the stairs are heading before stepping on. -Hold the hands of small children. -Hold on to loose items in one hand and place the other hand on the hand rail. -Keep loose clothing away from steps. -Don’t ride with hand carts, luggage carts, wheelchairs, strollers, etc. -Never walk up an escalator that is not running. -Don’t climb on the handrail. -Step over the comb fingers when stepping off. Don’t just slide your feet off. -Move clear after exiting and make room for riders stepping off behind you. If you or a loved one has been injured in an elevator or escalator accident in Massachusetts, contact Boston Injury Lawyer Jeffrey S. Glassman for a free and confidential appointment to discuss your rights. Call 877-617-5333.